Friday night movies and dinners have become a rarity in our lives since our little one appeared on the scene. We are now on the look out for new ways to perk up those Friday evenings and recreate the magic of those date nights albeit at home. Last Friday, we caught up on Don 2, and what better accompaniment to a Hindi movie than a dinner with an appetizing dose of some ‘masala’? 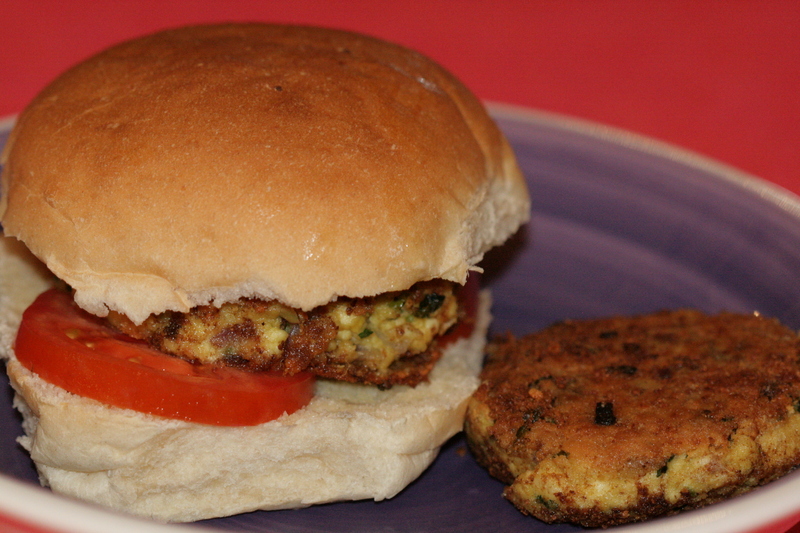 Presenting the Chickpea tikki burgers! This recipe makes 10- 12 patties and leftovers keep well in the freezer. On the day, combine the chickpea paste with the paneer mixture. If it is too wet, you can add in some breadcrumbs to bind it together. Form into patties or tikkis to match the size of the buns. Roll them in the chickpea flour so that they are nicely coated. In a sauté pan, heat 2 tablespoons of oil and wait till it is really hot. Add in the tikkis and cook well till they are crisp and golden brown on both sides. Let them cool for 5 minutes. Sandwich them into your buns, along with tomato and cucumber slices, lettuce or even a slice of cheese. Tah-dah! The Chickpea burgers are ready to go. These burgers are perfect for a cosy movie night in. Add a hot chocolate or a strawberry-banana smoothie on the side and you’re all set. Notes: If you prep stages 1 and 2 in advance, dinner can be on the table in 20-25 minutes. Again, I used 2 sauté pans to speed up the process. This entry was posted in Miscellaneous recipes (non PP) and tagged chickpea burgers, chickpea patties, masala chickpea burgers, masala movies. Bookmark the permalink.